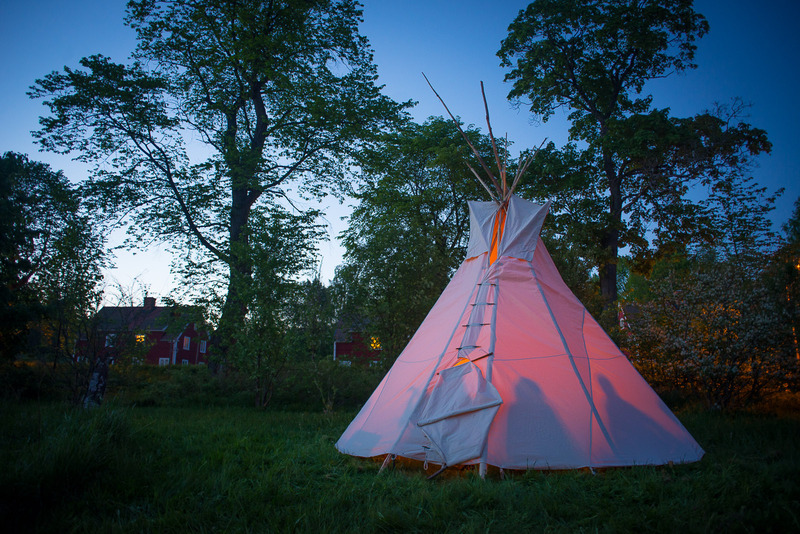 Build your own Tipi – Learn how to sew and assemble your own Tipi! Max participants 10 (5 tipis). Bring a friend and get 50% discount if you are working on the same tipi! Joshua Roxendal has several years experience of living in and building tipis. In the past 4 years he has also made a deep dive into the areas of natural building and designing rocket stoves for efficient cooking and heating. The course fee does not include the cost of materials for fabric and thread. You can buy all the material through us at a cost of SEK 3,500, or you can bring your own. The fabric should be at least 350gr/m, preferably even rougher. Poles of about 5.5m lengths are needed for tipis of 3.5 to 4.5 meters. This usually requires about 7-11 poles. We can sell 11 poles peeled and ready for the price of 800 SEK. The word Tipi comes from the language of the Lakota, the plain Indians of North America. Ti means “staying” and the ending pi is the plural – “number“. Thus it is an accommodation for more! Before the Indians had access to horses, their tipis were smaller. Once they had horses, they could reach a height of about 8 meters. ← Sgraffito: Mayan symbol in natural clay plaster!